Each pair is a virtual artwork. 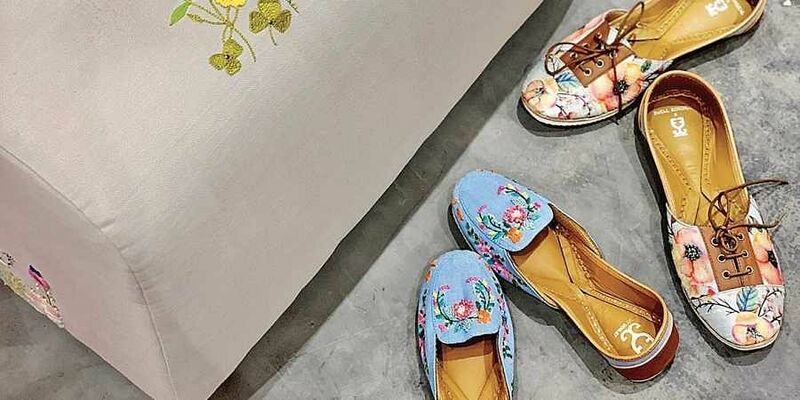 From petals in pouting pinks, leaves in sky blues and chartreuse clusters to muted gold and silver flecks, sandy tones, sequins, intricate resham threadwork and finely realised French knots—the slip-ons simply floor in contemporary complexions and couture cuts. Laksheeta Govil, co-founder and creative head of jutti brand Fizzy Goblet, is busier than the proverbial bee, having just put finishing touches to the brand’s first store in tony Palladium in midtown Mumbai. The space marks the debut of Fizzy Goblet in the offline space after a smashing sales run online. “Putting together our flagship store has been a labour of love, an organic growth for our five-year-old brand,” confesses Laksheeta, as she powers the mechanics of selling India’s edgiest juttis by the lakhs, with her husband Abhinav Mehra. The duo stands powered by a team of over 30 dedicated individuals—“most of them women as they tend to understand the dynamics of the product better,” says Laksheeta. The Insta handle of the brand tosses up over two lakh followers at a glance. The numbers multiplying by the day, as Fizzy Goblet successfully gobbles a meaty chunk of the traditional footwear segment. Gone are the days when your feet winced with shoebites on sporting colourful, but uncomfortable juttis you bought on a whim from Rajasthan, or the typical Pakistani juttis you chanced on at an exhibition. A homegrown success story, having tested waters through online sales earlier, Fizzy Goblet has taken sure steps to amp up its presence. The product comes with quality assurance: the juttis are handcrafted in leather, with inner padding to zap in comfort. Silk and hand-embroidered fabrics bring in that contemporary charm to the traditional pick, as the jutti has been a quintessential inclusion in every woman’s wardrobe for years. Actress Sonam Kapoor Ahuja chose to give away Fizzy Goblet’s Aisha juttis to all her friends and family members at her pre-wedding mehendi ceremony last year. Shaped in a happy, festive combination of white and gold, these have been a constant favourite on the FG bestseller list since, much like the neutral tones of the Champagne Supernova with the leaf sequins winking in classic glory. The Bollywood clutch of Anushka Sharma, Jacqueline Fernandes, Alia Bhatt, Huma Qureshi has been seen trotting around in Laksheeta’s prized footwear as well while making public appearances. The key lies in reinvention. 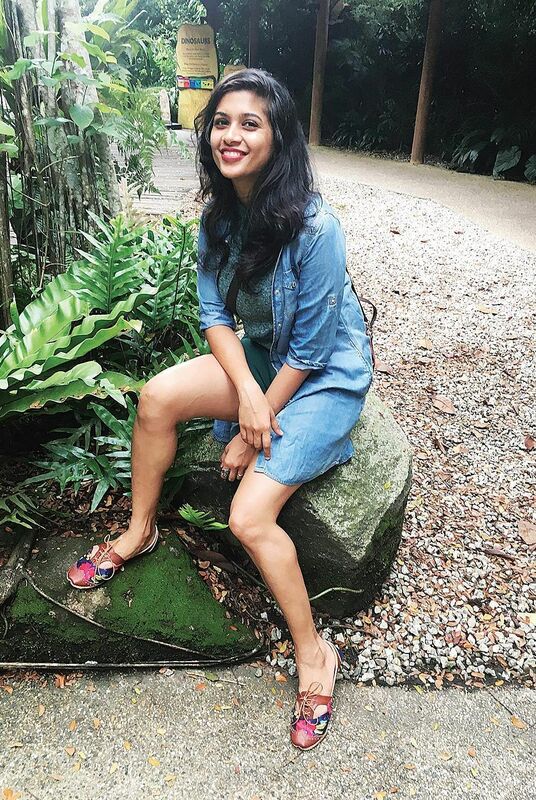 Quick to sense the leaning towards athleisure, Laksheeta and Abhinav have interpreted it in a flurry of innovations in Fizzy Goblet offerings, including lace-ups on denim, sneaker juttis, rubber soled ones, loafers, broguesters (juttis with brogue patterns) and fun prints like Panda, the Sail Away Sneakers series, Udaipur juttis and more. “The truth is, I get bored,” laughs Laksheeta. “That makes me come up with newer, fascinating designs. I believe in never saying never.” Contemporary, chic, classic and crafted with care. That’s the sustained metaphor in this jutti jive for you.